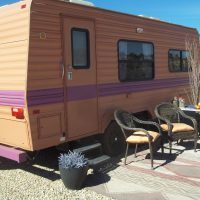 "Goin To The Dogs" theme 1989 Komfort 21' Totally refurbished! Sleeps 4, dinette folds down, front bench folds to single, front bench folds to double. Full bathroom with tub. Fridgerator with separate freezer, painted with chalk paint to draw on. Dining table has extra leaf to expand. Extra attachable outside dining table. 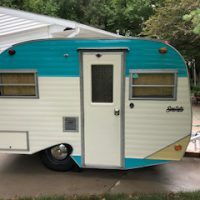 1974 Roag Travel Trailer. The box is 12 foot long but 16 foot in length overall. New tires and tags. 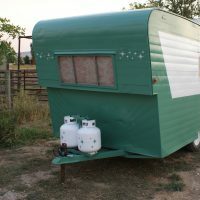 Has gas lantern, sink, stove, oven, 12 volt, 110 volt and roof vent. No A/C or bathroom. Priced to sell for $5000 or best offer. 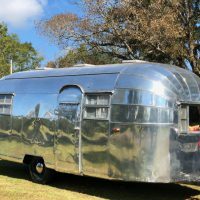 We have a beautiful one of a kind 1953 Airstream Flying Cloud that has been restored from the frame up and is ready to go on your next trip! This one is a pretty rare find and only 18ft long! Weighing in at 2700 lbs it can be pulled behind a SUV easily. I am renting my little "writers retreat" and will be selling it at some point next year. 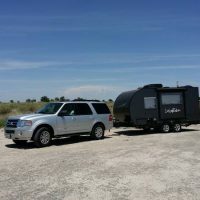 I love this trailer and traveled solo and lived in it for 18 months with the intention of making a big life change ... and I did. I am showing a rate of $600 a month to rent it but the number may vary depending on what you want to do. 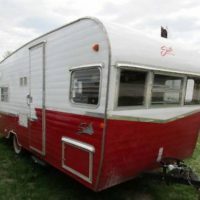 See more pictures at: https://wyoming.craigslist.org/rvs/d/1963-leisure-home-vintage/6699628523.html Cute, light weight camper for sale. Tow weight estimated 1500 lbs. Propane stovetop and light. Icebox. Electric 110v lights and outlets. Some dents as shown in photos, but otherwise very cute and functional. Clean WY title. Bearings repacked. Locking door. Breakfast nook folds into bed. Gravity fed water tank to sink. 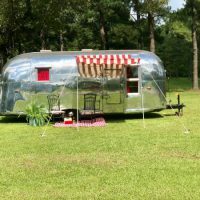 1958 Airstream condition: like new cylinders: other fuel: other paint color: custom size / dimensions: 22ft title status: clean transmission: other We have a 1958 Airstream Caravanner that has been restored from the frame up and is ready to go on your next trip. This is a very rare camper and very hard to find. 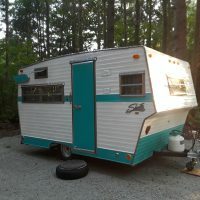 1971, 17 ft Cavalier Camper. Very cute inside and out. Has original appliances and furnishings. Some new accessories. Original working Windows. Couch pulls out to full sized bed, upper cupboards fold down to make bunk. Must be towed by light truck or mid sized SUV. Asking 5,800.00 or o.b.o. Located in Southern California but can transport for fee. 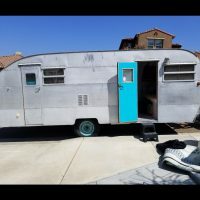 This truly vintage camper has been VERY well maintained and is pretty darn close to having all it's original pieces/parts...and all in working order. It's the real deal! We would REALLY like to find a good home with someone who will appreciate, love and take good care of it…and have as much fun with it as we have. Purchased in 1978 when I was a young woman at age 32 . I was the second owner. Within the past 2 years I began the restoration/renovation. I was ready to put her back on the road! However, after 2 outings I decided that at age 72 I am not as enchanted with it as I was 40 years ago. 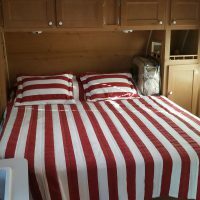 Fully self contained with walk around queen bed. Bench kitchen table. Only used 3 times in excellent condition..
"Rosie" the mobile glamper has been completely renovated. She's in excellent condition. New awning, tires are in good shape, A/C works like a charm. No leaks. The price includes all the interior design items including bedding. I just want her to go to someone who loves her as much as I do! 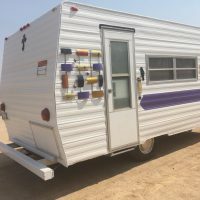 *Motivated Seller* It is time to sell Miss Shasta! 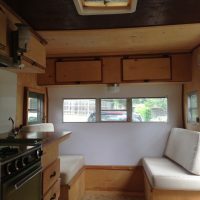 This camper has been all that I had hoped for as I dreamed of a summer adventure with my kids! I bought it in May and it is ready to be sold so that I can head back home (out of state) before school starts.